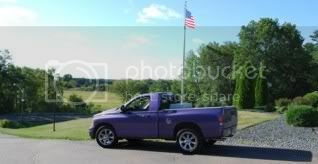 RumbleBee.org - The Dodge Ram Rumble Bee Owner Community :: View topic - Congrats to 1SG#1892 for March TOTM! Congrats to 1SG#1892 for March TOTM! Posted: Wed Feb 28, 2007 9:44 pm Post subject: Congrats to 1SG#1892 for March TOTM! Well just want to say Congrats to ISG for March TOTM!! Nice truck man and well deserved win. All trucks were great looking and it was a hard descion again this month. Congrats again man!! Thank you, we have a lot of great looking trucks on this site. Just a slow old truck. all were amazing looking trucks! Congrats! big congrats. you have put a lot of work in your truck. it looks amazing. Congratulations 1SG! Well deserved win. Thanks for keeping the good thought for me Gray. Hate to admit it, but I think that the tribe was right on with this vote! Congrats John! Extremely well deserved! Dave "Big Dog " Breiner a.k.a. " Roktman"
`04 SRT-10 Viper Truck- Stock...NOT!